One of India's busiest beaches, Calangute beach in Goa attracts thousands of foreign visitors to its shores every year, and is the prime beach holiday destination for domestic tourists in India. The beach itself has understandable appeal - a long strip of white sand stretching as far as the eye can see - but its charm is a little lost due to the sheer number of people, by the noisiness, the alcohol fuelled environment and generally hectic atmosphere. I'd recommend walking along the beach towards Baga for a more relaxing place to sunbathe. Calangute town is no less hectic, with traffic, fumes and uncontrolled waste dumping (but this true of many Indian towns). 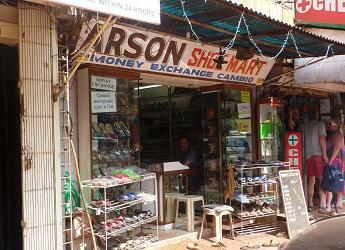 Despite these problems, as well as mass development, Calangute is not without a quirky appeal and residual charm. A lively covered market selling fish, fruit and flowers maintains an authentically Indian feel. Being such a popular destination for tourists, there are some excellent restaurants in Calangute, all the amenities you are likely to need and of course a crop of high quality hotels, many of which are far enough away from the main roads to feel quite peaceful. Is this your favourite Goa beach? We would love your contribution, so please tell us about your favouite Goa beach, and we will publish it on our site! Visit the Market Calangute's covered market just off the main crossroads in town is worth a wander. 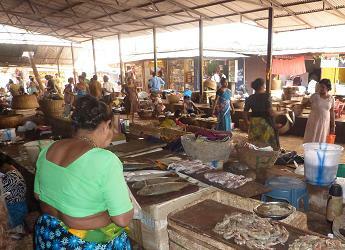 Fresh fish, fruit, vegetables, meat, herbs and spices scent the air in this authentic Goan food market. Saturday sees a colourful open air market held just behind the post office. Stroll Along the Beach Join the masses for a stroll along the famous Calangute beach in Goa - sunset draws in the crowds - and pose for pictures with the other holiday makers. The Kekar Art Gallery In Guaro Waddo (south end of Calangute), the excellent Kekar Gallery also has classical music performances on Tuesday evenings (R.300). Have a look at the Kerker Gallery website here. The nearby Cafe Literatti Bookshop is also worth a browse. The Tibetan Market The cool, quiet Tibetan Market by the main junction in Calangute town offers a pleasant break from the busy streets. Buy beautiful jewellery, clothing and handicrafts, or simply browse with minimal hassle from sellers. The Plantain Leaf One of the best restaurants in Goa! Read more about it in 'Places To Eat' below. Calangute is easily accessible from Panjim and Mapusa - buses pull in at the T Junction in town, opposite the covered market and next to the Shantadurga Temple. Both journeys take about 45 minutes. Some buses continue to Baga, stopping on the way at Calangute's main crossroads. If you get off at the temple, it is a short walk west to the crossroads. Continue west along the same road and you will reach the sea. Taxis and rickshaws are in plentiful supply in Calangute, but tourists are likely to be fleeced if they are not prepared to haggle. It is possible to hire scooters, motorbikes and bicycles in town, but don't forget the traffic can be very hectic in Calangute and it would not be the best place to get your first taste of the Indian roads. The nearest petrol pumps are in Anjuna and Mapusa. If you come directly from the airport, a taxi to Calangute will cost R.600 to R.700 - head to the pre-paid taxi stand and enquire. To save money you could travel by taxi to Panjm and get the public bus from there. There are many restaurants to choose from, and the prices are a little higher than in other parts of Goa. If you enjoy Thai food, don't miss the Oriental Royal Thai which is just south of the main crossroads. For three courses you will pay around R.800. Most highly recommended is Plantain Leaf by the covered market. This wonderful 1st floor canteen style cafe/restaurant serves perfect dosas, excellent thalis and all manner of lassis, fruit juices and snacks. This place is always a treat, and has a secure position in my top ten places to eat in Goa! If you decide to stay in Calangute, you will find some of the quietest accommodation in Maddo Waddo, the fishing district in a leafy area south-west of the crossroads near to the sea. Hotels in the area include Camizala, Casa Leyla and CoCo Banana. It is always adviseable to book ahead if you plan to stay in Calangute. If you are on a tight budget, Calangute beach in Goa is not really a viable option. Cheaper beachside accommodation exists at Anjuna, Vagator or Arambol to the north. Calangute beach in Goa is perhaps the busiest in the state. If the crowds begin to get to you, consider a visit to the quieter beaches of the south, such as Palolem or Patnem.